But LogoMaker takes the “none of the above” approach, instead putting the .PNG file in your own hands and advertising itself as a “free” logo maker where the deed is of your own doing. I’m always enticed by the promise of something free, so I have to give it to this little site: I’m intrigued. And if you’re reading this, there’s a chance you are, too. So let’s dig into the inner workings of LogoMaker and see if the quality matches the promise. Because if it does, you can be on your way to creating quick logos for web sites without so much as a hint of hiring a professional designer on your own. I’m skeptical, you’re skeptical; let’s see if LogoMaker wins us over. First Things First: How Are the Logos? Before we get off the beaten path with questions about usability, interface, price, and a bucketload of other details and concerns, we have to ask the proper question first: just how good are the logos you can create? Not too shabby, huh? The fonts are clean and nice and the cookie-cutter templates are pretty attractive and really do look like professionals built them – probably because they did. Of course, this means that other people will be able to use the same essential logo designs as you are and if you’re going for a much more unique experience, LogoMaker is probably not going to be your logo maker of choice. What can I say? Standing out from the crowd comes at a price. You’re not coming to LogoMaker – or a LogoMaker review, for that matter – unless you’ve got logo needs in a hurry. You know, something cheap and quick you can build that will eventually be taken over by a much more professional, customized option. If LogoMaker excels at one thing, it’s building those “holding place” logos for your web site that look good enough for now but that you’ll eventually want to replace with something more representative of your true brand. Is that surprising? It shouldn’t be; LogoMaker is free to try out, after all, and you’re not going to get the total top-notch goods in any field without paying something in exchange. And since the service is initially free, it definitely merits a quick once-over so you can be sure LogoMaker isn’t where you should start. Especially if you’re someone just starting out yourself, like a freelancer, budding entrepreneur, or someone setting up a business on the side. And besides, LogoMaker is just fun to use because you get to play graphic designer for a little bit. Sure, it’s design-by-boilerplate, but hey, I get to pretend I’m an artist for a little while. That’s worth zero dollars, no? Speaking of the low price, there are a number of advantages LogoMaker holds over the other guys. I just mentioned that LogoMaker is best-suited for any freelancer or entrepreneur starting out. But it’s also a great way to accomplish a number of other things. For example, let’s say you’re still proposing a business idea to a potential partner. And when you give him a formal business proposal, you attach your free LogoMaker logo on top of the letterhead. Ingenius move, right? Of course. And it’s something you just can’t get with the paid guys, unless you want to pay for that sort of thing. But wait for it: I’ve got some bad news. That whole “free” thing only lasts until you decide to actually use your logo. That’s right: you have to buy your own logo for $49 once you’re done designing it. It’s weak sauce, I know. And nothing really turns me off of LogoMaker than that. Forget the “ingenius move” mentioned above. Forget all of the plans you had of creating easy, free logos for your business cards, scattering the cards around the room, and making a business card angel. The whole thing turns out to be a bit of an empty promise. Is $49 cheap for a logo? Yes. But I’ve paid $50 for my own logo project and it was handled by a professional who custom-tailored it to me (my source: Elance.) The one extra dollar is worth it, and it blows LogoMaker’s cookie-cutter demands out of the water. Throughout this review we’ve both gone on a journey; we were initially excited about the prospect of easy logos that abandoned the typical crowd sourcing method many others have employed. We accepted LogoMaker’s faults and even made excuses for the boilerplates. But ultimately, it’s LogoMaker’s absurd demand of $49 for a logo you designed that makes us end this review on a sad note. Two out of five stars. How did it come to this? Pretty simply, actually: price is one of the most important factors when considering where to go with your logo. And if you want cheap, it’s not hard to find both cheap and unique if you know how to look for it. Heck, you could spring for a $200 design at a site like 99 Designs and feel every penny over $49 was worth the extra options you had. LogoMaker, I’m disappointed in you. Still, that shouldn’t prevent you from trying out their easy logo design interface and having a little fun. Downloading the logo will cost you, of course, but being able to create a custom logo that quickly does have its own appeal. It’s just not a professional appeal – it’s all about entertainment value. Hi, and thanks for these interesting and useful reviews. About LogoMaker: If I understand you right it’s possible to create a logo you like on the screen, but not possible to download it without paying. Why not simply design your logo using LogoMaker, and then use a program like Snagit or similar to grab it off the screen? Thanks for the review. I hope you’ll allow me to clarify a couple of items. Logomaker is indeed a free logo design service. On the site we clearly state that customers can create and download a free web logo which is a snippet of HTML code that customers can place on their website. There is no charge for this service. There is no limit on how this code can be used (see the T&Cs for details). And, for more savvy users like yourself, you can always control click the image to save the .jpg directly to your hard drive. No need to use Snagit as Jan suggests. For customers who want a high-resolution version of their logo (or any of several other file formats) we provide those for the $49 fee you mentioned. Why do we charge a fee? To pay for our staff of designers and account managers who are here to help our customers. Our service was created for the many entrepreneurs who are just starting out and want to prove their business concept before dropping a lot of money on a more custom logo design. Most have only a few hundred dollars to spend on marketing for the entire year and a custom logo project can eat that up. We also see a few students who want a logo for school projects come through our site. 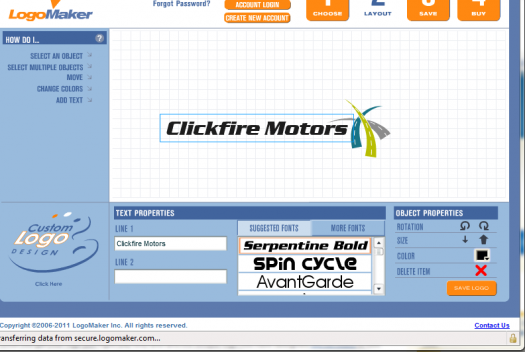 There are several advantages to using the Logomaker tool for creating your logo. Free or low cost is just one. We offer more than 10,000 different icons, all of them created by professional logo designers. It’s fast—as you saw when you tried the tool, you can create a professional-looking logo in as little as 10 minutes. And it’s easy (no back and forth). With Logomaker, it’s all you. Play with it until you’re happy. Then save and download. And you can create and save up to six different logos, and even ask your friends to give their opinions on the designs—without paying a penny. And finally, Logomaker is a service offered by HP. You know we’ll be here if there’s ever a problem. The Logomaker tool isn’t for everybody. But those customers who use it tell us they love it. Check out some of the testimonials posted on the site and on our blog. Compared to other free logo generators, Logomaker stands above the rest. There are things we can improve (and we’re working hard to do that), but if it were up to me, I’d give us 4 stars out of 5. Dan, It’s great reading your perspective. Knowing who the intended audience is definitely changes my view of Logomaker-I’ve been there in the startup stages where it doesn’t make sense to spend your budget on a logo, yet you need a logo. I designed two logos to compare which one I liked the the most. My goal was to use the free offer since I didn’t need at this time a paid logo. I read the review by Dan, because I was suspicious of the “free” offer. Well, as it turns out it does cost you to download the logo you design to save on your computer. I spent considerable time doing this and thought maybe the review was wrong about the “free” part. Sadly it’s true. Seems the part about being free only applies to designing your logo, not to actually being able to use it. Guess I’ll have to try elsewhere.